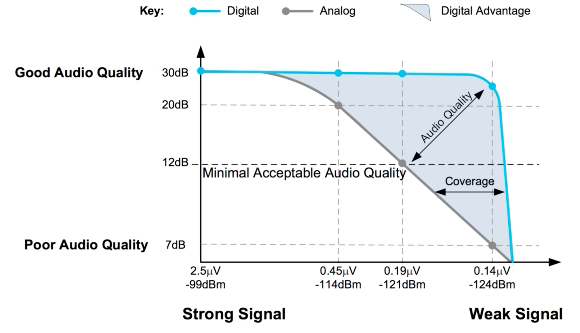 For starters, you will need to buy an HD Radio. You can find them at various retailers online, such as, such as Amazon, Best Buy and Crutchfield. For listening in the car, you can connect a portable HD Radio to the auxiliary port on your existing stereo using an audio patch cable. Once you have your radio, tune to 88.7FM and wait for the HD logo to light up. For more details about HD Radio, see below. The simplest way to listen online is to visit our Listen Live page. Open it on your desktop or mobile device and press play. For our mobile users, we have newly redesigned apps in the iOS App Store and the Google Play Store. Our stream is also available via iHeartRadio and TuneIn. For more details on how to listen online, see below (desktop and mobile). 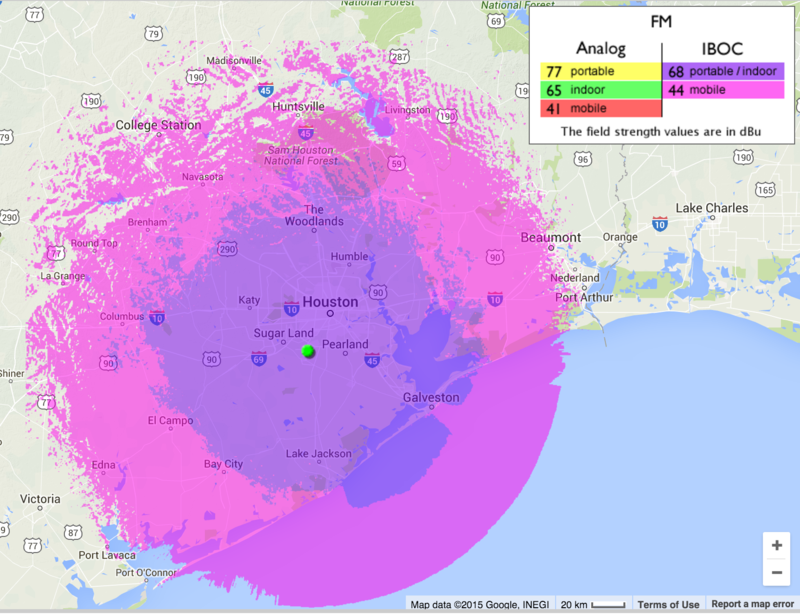 KUHF, Houston Public Media News 88.7 transmits at 88.7MHz on the FM band. 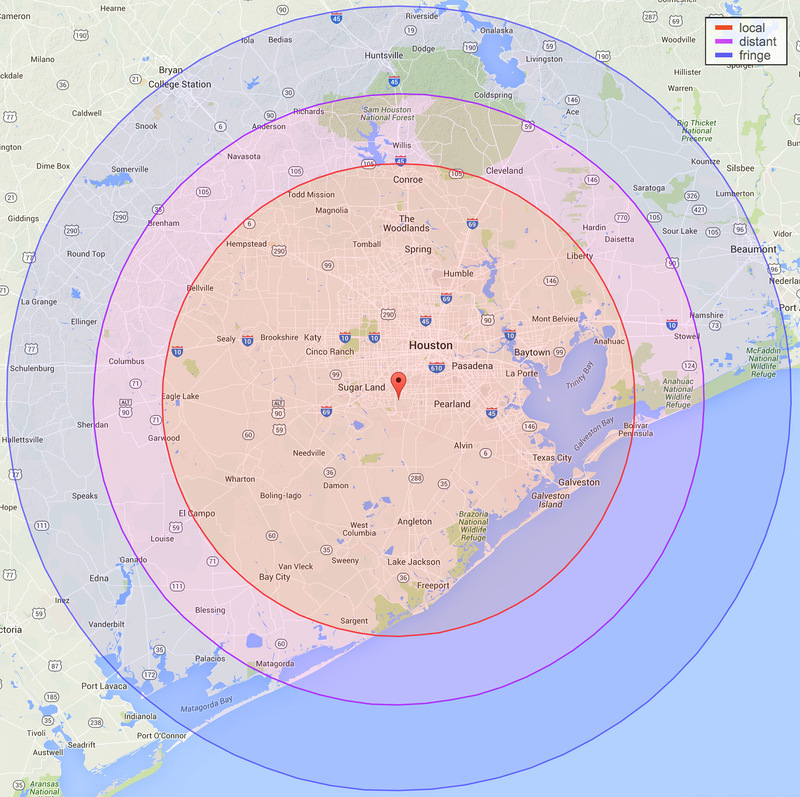 It is broadcast at 100,000 watts from a 1,722 foot tower located southwest of Downtown Houston, midway between Sugar Land and Pearland outside of Beltway 8. Due to height of the tower and the relative flatness of the terrain in the Houston-Galveston area, KUHF’s signal propagates pretty evenly. Since FM relies on “line-of-sight” propagation, areas around the Galleria and Downtown can experience issues due to the grouping and density of the buildings. This map illustrates the predicted coverage area of KUHF’s analog transmitter. The area inside the red circle represents what the FCC regards as a “city-grade” signal, meaning it averages 70dBu or above. The purple circle represents an area with an average transmission power of 60dBu. If you use the HTTP link listed above in iTunes, it won’t work, so you have to provide this link with its iTunes-specific protocol at the front. News 88.7’s streams are also available in a number of other streaming apps. Houston Public Media also provides a third content stream called Mixtape, which features contemporary alternative rock from XPoNential Radio, a service of WXPN in Seattle. It is broadcast over-the-air on KUHF 88.7FM’s HD-3 channel. Mixtape is also available online, via our Listen Live page, in the KUHF News app (by tapping the “Choose Stream” button), TuneIn, and in the NPR News App. If you wish to listen to Mixtape in a standalone player, all of our available streams have been compiled into one playlist file, or you can choose which stream is best for you.